Today I noticed i was eating two cucurbits for lunch. I know, weird thing to notice, but these were from such different origins and I hadn't slept much and what can I say, I noticed. The first was some melon from last year from our farm that I had frozen. Adam Hausman of Adam's Berries gave me this idea a few years ago. I was bemoaning the lack of winter fruit and he told me about melon in smoothies, The unfrozen consistency is such that that is about all the melon is good for. That or ice cream or mousse or something. But boy is it good for it. You would be surprised how flavorful our melons are and how distinct fresh summer flavor comes through even when mixed with aging bananas and frozen blueberries. The Hardest part is chopping the melon off the giant hunk (I froze it in a gallon freezer bag, which I have made about a 12 smoothies with and could probably make another 12 before it's all gone. 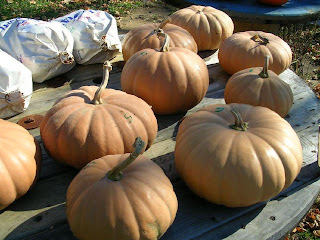 The other cucurbit is pumpkin (this family also includes in case you didn't know cucumbers and summer squash). My son Ciaran was insisting on pumpkin bread so Rachel bought a can of pumpkin. This is the second time we have bought a can of pumpkin. Normally I make mashed pumpkin out of either Queensland blue or the tan long island cheese pumpkins, both great tasting, (and Queensland stores really well too) but the flood more or less wiped out the winter squash crop (which coincidentally is one of the things I am planting up at South Village). Well, I have heard that this is one thing that you might as well get canned. People say for all the work it makes little difference if you use canned or fresh pumpkin, so I thought I would try it. IT DOES MAKE A DIFFERENCE. Both now and at Thanksgiving I was disappointed. I mean, the canned was passable, but there is definitely something missing, and to be honest, I don't find the pumpkin cooking process that odious, especially in the middle of winter when you want to heat up your house anyways. Yep, the next few weeks are always the hardest for fresh and local veg, then it starts to ease up with baby spinach and asparagus etc. I wanted to thank all the members that have already signed up. Link to website has also been added to this sidebar, so now you can just go back and forth between the two, which I know you have been waiting for. 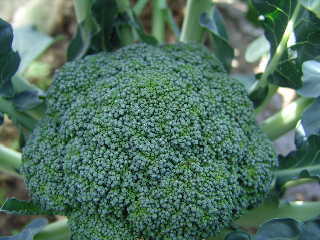 Time to seed the broccoli tomorrow. My main crop broc was going to be limba, pictured here. But having to switch up to fiesta, not the worst thing, but I have already seen limba do well under many conditions last year, even after the centers get hit by sweet midge they had lots of juicy side shoots. Also seeded snap dragons, leeks, and beets today. Next week in the field prepping. More Later. Don't want to blow everyone's mind with too many advances at once, but OHF has moved online in a big way. For one, we have a website www.openheartfarm.com - the blog will still very much exist, and be the day to day week by week go to, but the website has the brochure also, but maybe even more amazing, at least to me, is you can now buy your open heart veggie shares with your credit card or paypal account. It is a basic site that may over time include recipes and more stuff, but for now it has our asic info with a few fun features, and looks great, I have to thank Eva Us who is doing it for us and did everything to make it look wonderful. In even another piece of tech news from the farm, we are officially a google place, which I wanted to do mostly so people could more easily get directions, so let me know if it at all helps with that. It was a bit of a process, but I have to admit I got into it and can understand how people get into the powers of technology, even tho i am generally a book reading tape listening to guy. Actual Farm, like on the real earth news: you all know it too: we will be in the ground at least a week earlier than normal and maybe two due to all this heat. The goal is actually not to get too far ahead of ourselves I think. Not that there will be a frost or anything, at least I don't think so. Just don't want to over-extend or have my peas before the CSA starts, actually maybe more of an issue with the spinach, maybe we will for the first time for us in Vermont, have two spring sowings of spinach, which would be exciting. That was easy in the longer slow progression of coastal Long Island, but this is looking like our year here. Brochure still is on sidebar, hope you all like the website and please comment and let me know what it could use. Poor Man's Fertilizer is a spring snow once the ground is already thawed. Ours is a little bit, so I'm hoping to get some of the positive effects, which mostly come from the higher nitrogen content in snow. So these past few snows have been nice for me. Even went to the Burlington Country Club hill for the first time with Ciaran. Rachel and I both survived a few rides. Ciaran, as per usual had to be dragged away from the action. But I digress, the whole fertilizer thing was making me think of a few things people may not know about our farm in particular and farms that grow organically in general, especially with regards to the soil. One of the organic mantras is "feed the soil" - keep the soil healthy and you'll be in good shape. Mostly in the past I did that strictly though compost, which supplies lots of organic matter, but is also rich in other nutrients. Now trying to balance that with green manure more, as I believe I mentioned in earlier posts. But we also do use fertilizers. Ours aren't made from petrochemicals, instead mostly from two sources: pasteurized chicken manure and various forms of seaweed. Actually, luckily for us, the are made locally by a great company: North Country Organics. Even when I was farming in Long Island, we had pallets of their cheep cheep (I know, cute name) basic chicken manure mix sent to us. This year we are in really good shape, after the floods we did lots of soil testing and one thing it revealed (besides a lack of toxins) was the all our fields had an average of about 3.4% organic matter. That is fairly good. 5% is ideal, really don't want to go that much over that I don't think, and under 2.5 - 2.25% you start having significantly less fertility. So that plus a little poor man's fertilizer and things are looking good, as far as the ground is concerned, at OHF.